In February the Texas hornshell mussel, Popenaias popeii, became the first among 15 state-threatened freshwater species to receive federal protection under the U.S. Endangered Species Act. A team of Texas A&M AgriLife scientists led by Dr. Charles Randklev in Dallas now works alongside collaborators from Laredo Community College and the Illinois Natural History Survey to better understand the species' ecology and taxonomy. Their goal is to identify contributing factors to the Texas hornshells' decline and provide data to the U.S. Fish and Wildlife Service and Texas Parks and Wildlife Department to aid in its protection and recovery. "Hornshells' decline is related to changes in freshwater quality and quantity; that much we know," Randklev said. "Ultimately, our studies and others will be used in an overarching effort to protect existing populations and hopefully reverse their decline." Scientists know of only four locations across the U.S. where the endangered mussels survive, he said. Texas populations are in Devils River and in two areas of the Rio Grande. The fourth population is in Black River, New Mexico. Randklev's lab, located at the Texas A&M AgriLife Research and Extension Center at Dallas, investigates how changes in water quality and quantity affect Texas hornshell populations. 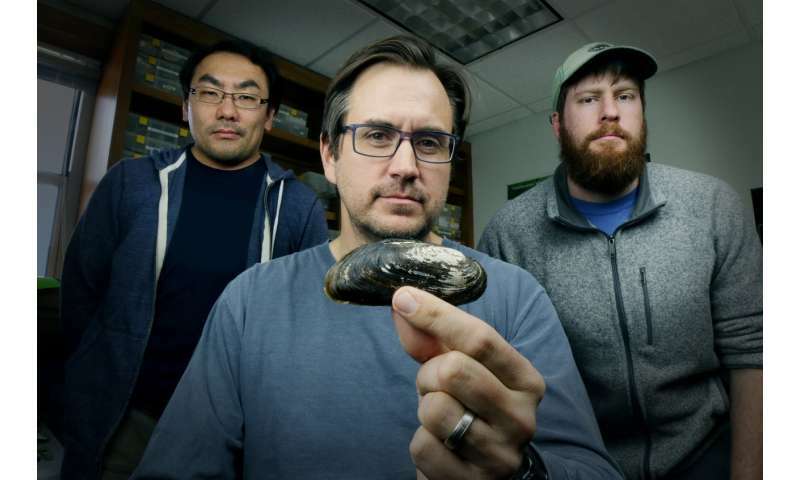 His team, part of the Texas A&M Natural Resources Institute headquartered in College Station, will examine how increasing salinity and temperature influence mussel growth, survival and reproduction. Michael Hart, research associate in Dallas, called the Rio Grande one of the more challenging river basins in the U.S. for aquatic life due to the changing conditions. "There are places where Texas hornshell occurs in the Rio Grande where we know increases in water temperature and salinity are occurring," he said. "Impacts on these populations will likely worsen with climate change and increasing human activity in these regions." The mussel team also evaluates the relationship of Texas hornshell in the U.S. to a closely related species in Mexico. Prior to the hornshell's endangered listing, uncertainty persisted among researchers over how far south the species ranged, said Dr. Ken Inoue, research scientist in Dallas. Inoue ran genetic comparisons of museum and live specimens identified as Texas hornshell from the U.S. and Mexico, showing the actual hornshell to occur mainly north of the border. "A genetic match would have meant Texas hornshell occurs primarily in Mexico," he said. Randklev said the federal listing still provides decision-makers, resource managers and researchers an opportunity to work on identifying factors leading to the decline and to develop solutions to benefit Texas hornshell and humans alike. "These mussels provide important ecosystem services to humans," he said. "You can only push them so far into decline before you begin to experience human health issues."